I have once blogged about a clock for math geeks but today I found a much cooler clock in Walyou, my favourite Tech website. This really needs more advanced math than I am teaching. 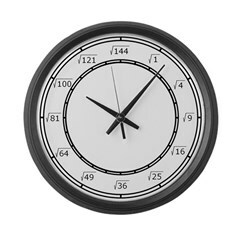 Walyou has intoduced many math clocks earlier and I decided to check what else could be found in the net. What I found funny was the discussion in cnet news. The expression for 7 gives 6.999... and the argument about 0.999... being equal to 1 continues. Maybe I should blog about that next. For a reminder, this is the one I introduced before. It also has some inaccuraties. 9 is only an estimate and 7 has two solutions. This cool but confusing clock I found in WebUrbanist, which has altogether 24 different Modern Clock designs introduced. Libraby of Math has a huge collection of math related clocks. 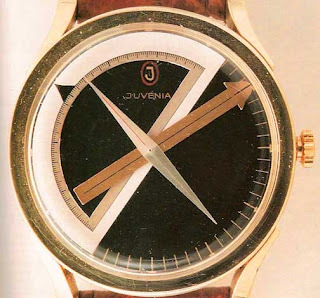 This is actually a watch from Watchismo, but I think this would be much better on the classroom wall. Even though I love math, I think this Turing alarm clock is too much... My husband and daughter want to continue sleeping after the first alarm. I would go crazy when I had to listen to all the alarms several times! When I wake up, there is no chance to continue sleeping; I am awake. The clock designs look beautiful and unique. I love the ones with the mathematical equations. Its a beautiful clocks collections..!! !Popular wall clocks are normally always bought in the analogue style, whereas the desk varieties are equally popular in digital or analogue format.